Video marketing has exploded tremendously over the past few years. It’s easier than ever to create high-quality videos and quickly upload them to YouTube using just your iPhone. But simply creating videos doesn’t necessarily guarantee anyone is going to watch them. You need to figure out how to promote your YouTube channel if you want to be successful. The first step toward building your audience is to get people to start watching your videos. If your titles are boring and non-engaging, nobody’s going to click through to watch your videos. So what makes a title engaging? The team over at Tubular Insights Tubular Insights did some research into YouTube titles from BuzzFeed, which is one of the best in the business when it comes to writing click-worthy headlines. When comparing BuzzFeed’s video titles on YouTube versus Facebook, Tubular Insights found the titles on YouTube were noticeably shorter. They also found that videos with shorter titles received more YouTube views. Videos with titles with between 41-70 characters received 64% more views than those with 70 or more characters. The takeaway here is to make your titles short and concise when possible. If your video was made with search intent, include keywords in the title to make it easier for other people to discover. Which brings us to our next tip. Titles and description: Include target keywords in your titles and descriptions. You can use a tool like Keywordtool.io to help you find keyword ideas. Mention keywords in your video: According to Brian Dean of Backlinko, saying your target keywords in your video can help YouTube better understand what your video is about. Engagement: YouTube uses engagement (likes, comments, views) to help determine where videos rank in its search results. Categories: Use categories to help YouTube get a better understanding of who to show your videos to. Tags: In addition to categories, you can also add tags to your videos to give YouTube more context about your content. You can use quite a few tags, so add as many as you can think of. Just like with SEO for your website, don’t keyword stuff. Use keywords when it makes sense, not just for the sake of having them. With any type of content you produce, you want to make sure it’s aligned with what your audience wants. Whether you’re writing a blog post or creating a video, start by getting to know your audience and what type of content they want to see from you. There are a couple of ways to get this info. If you’re just starting out, take a look at your competitors or other video creators in your industry. Look at which of their videos get the most views and engagement. This will give you an idea of what topics your audience wants to learn about and what style of videos they prefer. Another solution is to look at your YouTube Analytics if you’ve already uploaded videos. YouTube gives you detailed information on audience demographics, location, engagement and other helpful stats. YouTube has a very active community of users. Whether it’s the comments section of your own videos or others, people are always talking. A good way to promote your YouTube channel is to join in on the conversations. When someone leaves a genuine comment, take the time to drop a reply to acknowledge them and keep the conversation going. The bigger your channel gets, the more difficult it’ll become to reply to everyone. But when you’re just starting out and aren’t receiving hundreds of comments on each video, it’s much easier to handle. Notice how the top two stick out because of their eye catching custom thumbnails, particularly the first result. 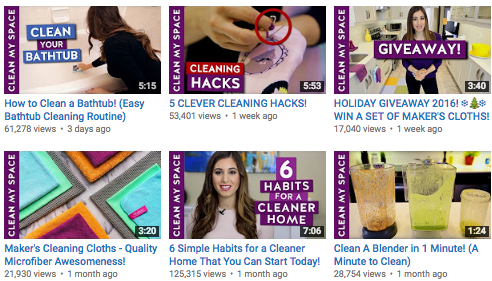 One of the simplest, yet effective tactics you can use to promote your YouTube channel is to make custom thumbnails. By default YouTube grabs a screenshot from your video and uses it for the thumbnail. Unfortunately, sometimes the image it grabs will be a blurry shot of you adjusting the camera or a transition. These aren’t appealing enough to compel people to click. Instead, use a tool like Canva or Photoshop to create custom thumbnails for every video you upload. You can even create a template with a particular font and style to make it more consistent and on-brand. Who better to tell other people about your videos than you? Think of ways you can promote some of your videos within your other videos. For instance, reference an older video within a newer one and leave a link to it in your description so it’s easy for viewers to find. You can also use annotation cards to help people navigate to other videos. However, try to wait until the end of the video to add cards to prevent people from clicking away in the middle of the video they’re already watching. For certain Google searches, you’ll notice YouTube videos in the results. Unfortunately, there aren’t any “rules” or standards for what searches appear in the SERPs. 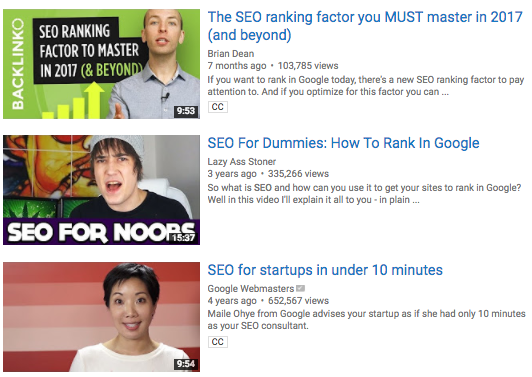 With that being said, “how-to” and tutorial-related queries tend to pull up video results pretty often. 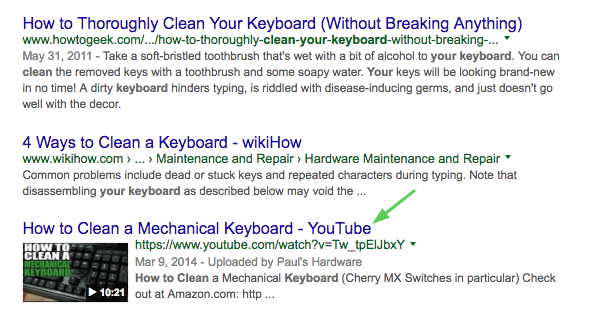 For instance, if you search “how to clean your keyboard” you’ll notice a YouTube video in the top results. Do a few Google searches for keywords you want to target and see if there are any YouTube videos ranking. If so, there could be an opportunity for you to sweep in as well. If there’s one thing YouTube users love, it’s a giveaway. Host a YouTube contest or giveaway to encourage people to subscribe to your channel and engage. To keep your contests simple, have people like your video, leave a comment and subscribe to your channel to enter. Make sure you’re following YouTube’s policies. Give away a gift that’s related to your brand, otherwise you’ll get a bunch of freebie seekers. Get creative by incorporating user-generated content and other non-traditional entry requirements. Be careful with hosting frequent YouTube contests. You want to make sure you’re getting results from your efforts, otherwise you’ll end up wasting time, money and resources. After doing one contest, wait a while and look at your subscriber drop-off rate and engagement numbers. If you aren’t bringing in engaged subscribers, you could just be attracting people who want free prizes. In addition to getting new subscribers, you also want to keep your current ones engaged. Create a recurring video series to entice people to look for new content from you regularly. For instance, Moz does a weekly video series called Whiteboard Friday. Fans know to check their channel every Friday to see a new video, even if they don’t receive a notification that it’s live. You don’t have to upload weekly like Moz. It can be a biweekly or monthly segment–as long as you’re consistent. Bonus points if you can come up with a creative or witty name for your series. If you blog, look for opportunities to embed your videos within the posts. This is particularly helpful if your blog gets a good amount of traffic. Use Google Analytics to find your posts with the most traffic. Then think of a way to make a video out of it. For instance, you could summarize the main points of the article, or go more in depth on certain parts. Then embed the videos within the blog post. This will get people that read your blog to check out your YouTube channel. The more videos you create, the more difficult it becomes for people to navigate through your channel. A great solution for this is to create playlists. Playlists allow you to group your videos into categories that are a lot easier to search through than a list of all your videos. Here’s a look at what our playlists look like. Your playlists can be fairly broad so you don’t end up with a bunch that only have one or two videos in them. As you create more videos, you can always add or change your playlists as needed. Want to advertise on YouTube but don’t feel like paying for it? There’s actually a free way to advertise on YouTube that a lot of businesses aren’t aware of. It’s called a Channel Ad. Channel Ad is a feature that allows YouTube to display one of your videos as a pre-roll ad for free. There’s no guarantee that your video will be displayed, but since it doesn’t cost you anything it’s worth turning on. To enable it, go into your Creator Studio. Then select the Channel tab and Featured content. Select your channel ad and you’re set. Sometimes just asking for engagement is the best way to get your videos spread. Not everyone who watches and enjoys your video will hit the like button. Giving them a quick reminder can be just the push they needed. Ask viewers to like, share or comment on your videos. You can either verbally ask or include some type of CTA in your video to remind them. Some YouTubers like to create a custom outro that asks users for engagement, which helps automate the process a bit. Live video is one of the top social media trends, and it will continue growing. With apps like Facebook, Periscope and Instagram making it easier than ever to stream live videos, it’s becoming much more common. YouTube has been offering live videos for a while, but it’s really starting to explode now. 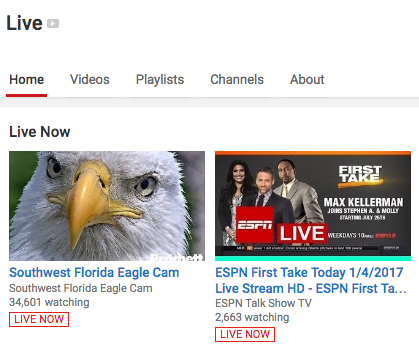 You can take a look at some popular YouTube Live videos to get a sense of how other brands are using the platform. Don’t worry if your streams don’t go as smoothly as you’d like. Part of the fun (and risk) of live video is you never know what’s going to happen. Just prepare the best you can and hit record. For more tips on how to get started with YouTube Live, check out Google’s introduction to live streaming. A tactic some of the biggest YouTube stars used to grow their following is collaborating with other users. Each collaboration gives you exposure to a new audience. And the best part is those new viewers are more likely to subscribe to your channel since you’re working with a content creator they already know, like and trust. The key to a successful YouTube collaboration is finding the right partner. You want to collaborate with content creators that share similar passions with your brand so your video is completely authentic. Check out this collaboration between SoulPancake, a YouTube channel featuring happy and joyful content, and Purina Tidy Cats. Purina’s goal was to reach younger, millennial cat owners and SoulPancake wanted to create a video their users would enjoy. So the two brands worked to find an overlap in their brand values, and come up with an idea that met both of their needs. The results? A video about kitten therapy that received over 9 million views to date. Display ads: These ads show up on the right-hand sidebar of videos, and are only available on desktop. Overlay ads: These are semi-transparent ads that are displayed on the bottom part of a video. They’re only available on desktop. Skippable and non-skippable video ads: These ads show up before, during or after a video. Skippable ads can be skipped after five seconds, but non-skippable ads have to be watched all the way through before the viewer can watch their video. Bumper ads: These are non-skippable ads that have to be watched before the viewer can watch their video. They can be a maximum of six seconds. Sponsored cards: These are cards that get displayed within relevant videos. You can use them to promote your products or other content. Learn more about YouTube’s video ad formats here. For your ad creatives, you can either use an existing video or create something new for a specific campaign. The advantage of using an existing video is you can choose one you know has been effective in the past. If a video has already gotten a lot of views and engagement organically, running paid ads can amplify your results. On the flip side, creating a new video for your ads will allow you to create a more targeted piece of content that you have more control over. For instance, you can create an ad with a specific call-to-action at the end to direct viewers to a landing page or another video. Unless you hit the jackpot and create a video that goes viral, you won’t build a massive YouTube audience overnight. But implementing the strategies above will help you steadily get more views, subscribers and engagement for your videos. Just like with any other type of content, focus on creating quality first. Then get people to watch your videos and you have a recipe for success. Have any tips on how to promote your YouTube channel? Leave a comment below!